Draw a shamrock on the craft foam. Or, print out our shamrock pattern and trace it onto the craft foam. 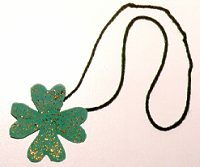 Use the paint brush to paint the shamrock with gold glitter glue. Glue the ends of the wool to the back of the shamrock to make a necklace.